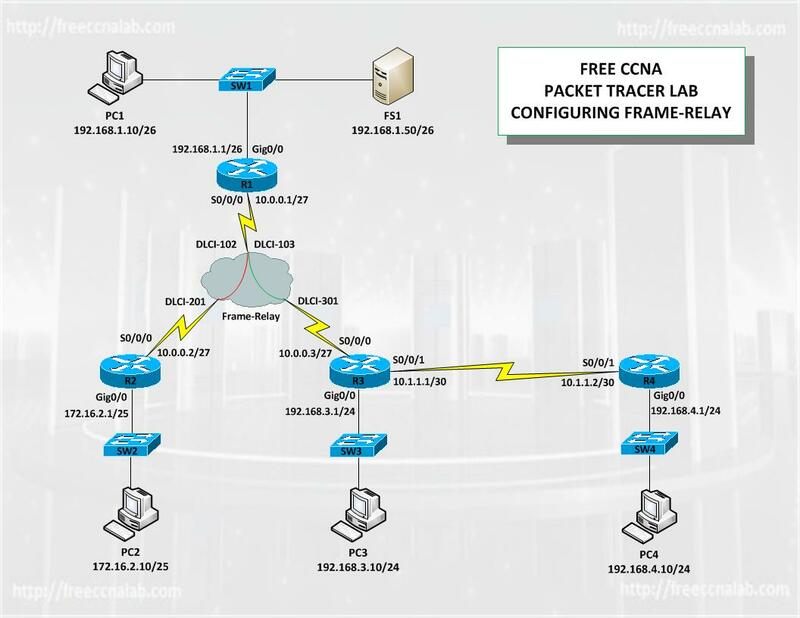 The purpose of this lab is to provide a better understanding of The WAN technology Frame-Relay, how to configure and troubleshoot Frame-Relay on Cisco routers. In this lab will explore several types of Frame-Relay Implementations. This knowledge is essential to passing the CCNA exam and will be used in daily in your position as a Cisco network engineer. Frame relay is a telecommunication service designed for cost-efficient data transmission for intermittent traffic between local area networks (LANs) and between end-points in a wide area network (WAN). Frame relay puts data in a variable-size unit called a frame and leaves any necessary error correction (retransmission of data) up to the end-points, which speeds up overall data transmission. For most services, the network provides a permanent virtual circuit (PVC), which means that the customer sees a continuous, dedicated connection without having to pay for a full-time leased line, while the service provider figures out the route each frame travels to its destination and can charge based on usage. An enterprise can select a level of service quality – prioritizing some frames and making others less important. Frame relay is offered by a number of service providers, including AT&T. Frame relay is provided on fractional T-1 or full T-carrier system carriers. Frame relay complements and provides a mid-range service between ISDN, which offers bandwidth at 128 Kbps, and Asynchronous Transfer Mode (ATM), which operates in somewhat similar fashion to frame relay but at speeds from 155.520 Mbps or 622.080 Mbps. By default Cisco frame-relay encapsulation uses LMI type Cisco, although if you are connecting to non Cisco devices you will need to configure the encapsulation as IETF and the LMI type as ANSI. By default, Frame Relay uses Inverse ARP to map local DLCIs to remote IP addresses, although it is considered poor practice to rely on Inverse ARP to map local DLCIs to remote IP addresses. The use of static maps prevents the use of Inverse ARP and is the recommended way to configure Frame Relay.